Prayers in the Chapel of St. John Chrysostom upon arrival in Englewood.On Tuesday October 16th, 2012, His Beatitude Ignatius IV, Patriarch of Antioch and all The East, arrived in the United States for a short stay which included several official functions. He was met at the airport by His Eminence Metropolitan Philip, Primate of the Antiochian Orthodox Christian Archdiocese of North America, and a contingent of over 30 clergy and laity. His motorcade was escorted by officers from the Passaic County Sheriff’s Department to the Archdiocese Headquarters in Englewood, New Jersey where His Beatitude resided during his stay in this area. The goal of the meeting was to set in motion the next phase of the cooperative effort between the University of Balamand in Lebanon, and the Antiochian House of Studies in North America whereby the two institutes of higher learning will award advanced degrees, such as the PhD. The two institutes of higher learning have been jointly offering a Master Degree in Applied Orthodox Theology since the year 2001 with great success. The next focus will be on PhD degrees in theological disciplines, followed by an expansion into other disciplines. His Beatitude Patriarch Ignatius IV opened the meeting by saying that it is his vision to “extend the reach of the Orthodox Faith through education and to insure that this education touches the lives of people in positive ways”. He thanked His Eminence Metropolitan Philip for the strong work that has been done in the Archdiocese of North America, especially by the Antiochian House of Studies in educating the faithful. His Eminence Metropolitan Philip welcomes His Beatitude to North America, and praised His Beatitude as a man of vision, especially in the area of education. He noted the courage that His Beatitude displayed in founding the University of Balamand in 1988, in the face of the very unstable situation during that year. Dr. Elie Salem summarized the work of the University of Balamand, and the enormous strides that the University has made, becoming a premiere institute of higher learning which is recognized around the world for the quality of education, and the openness to people of all cultures and backgrounds. Rev. Dr. Joseph Allen summarized the work of the Antiochian House of Studies, indicating that had broken new ground being known as a “theological school without walls” due to the nature of its focus on distance learning. The meeting concluded with the naming of a planning committee to work out the details of implementation, and a strong commitment to the continuing cooperation between the University of Balamand, and the Antiochian House of Studies. On Friday evening, October 19th, 2012, His Beatitude attended a dinner and ceremony which honored His Excellency Issam M. Fares, former Deputy Prime Minister of Lebanon and founder of the Fares Foundation. His Beatitude bestowed upon Mr. Fares the Order of Saints Peter and Paul, the highest award granted by the Patriarchate of Antioch. The dinner was held at the New York Palace hotel and attended by more than 200 guests. 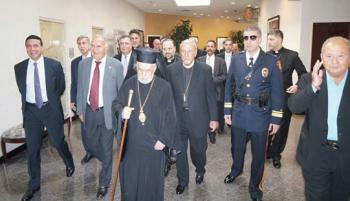 On Sunday October 21st, 2012, His Beatitude presided over the divine services at the Antiochian Orthodox Cathedral of St. Nicholas in Brooklyn, New York. On Monday October 22nd, 2012, His Beatitude departed for Houston, Texas. The entourage leaving the airport on the way to Englewood. 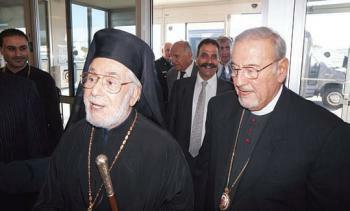 Metropolitan Philip meets Patriarch Ignatius at the airport. 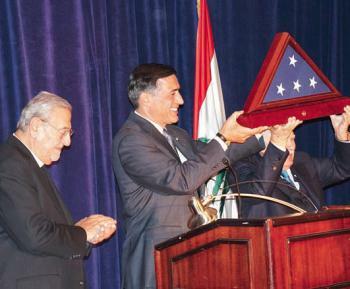 The meeting in progress Congressman Darrell Issa (c.) awards the U.S. flag to Mr. Issam Fares (r.) as Metropolitan Philip (l.) looks on. 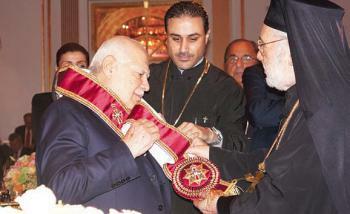 Patriarch Ignatius (r.) bestows the Order of Saints Peter & Paul upon Mr. Issam Fares (l.). Archimandrite Ibrahim Daoud (c.) looks on. The assembled staffs of the University of Balamand and the Antiochian House of Studies: L. to R. Fr. 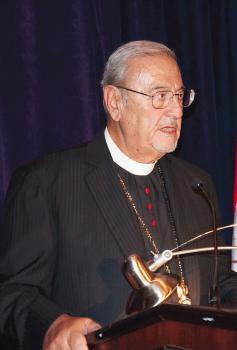 Michel Najim, Bishop Nicholas, Fr. 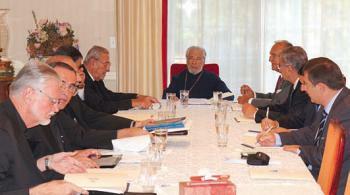 David Hester, Mr. Fawaz El-Khoury, Metropolitan Philip, Patriarch Ignatius IV, Dr. Elie Salem, Dr. Nadim Karam, Dr. Michel Najjar, Dr. Walid Moubayed, Fr. Joseph Allen.